Burundi, officially the Republic of Burundi, is a small country of rolling green hills and mountains in the Great Lakes region of Africa. It is bordered by Rwanda on the north, Tanzania on the south and east, and the Democratic Republic of Congo on the west. Much of its western border is adjacent to Lake Tanganyika, the deepest lake in Africa and the world's longest lake. Though near the Equator, its climate is temperate because of the altitude, which is perhaps why it and neighboring Rwanda are so heavily populated. The country's modern name is derived from its Bantu language, Kirundi. Geographically isolated, facing population pressures, and having sparse resources, Burundi is one of the poorest and most conflict-ridden countries in Africa and in the world. Its small size belies the magnitude of the problems it faces in reconciling the needs of the Tutsi minority and Hutu majority after centuries of suspicion and oppression. Burundi experienced three episodes of genocide in the twentieth century, due to the ethnic conflicts between the Hutu and Tutsi tribes. Hundreds of thousands have fled the violence, escaping to neighboring countries Zaire, Rwanda and Tanzania. However, small inter–religious and inter–ethnic groups have joined together in various locations in the country to rebuild their land through the reconstruction of schools, hospitals and homes that have been destroyed througout its years of conflict. This joint effort will also benefit the morale of the people, providing hope through its example of harmony and cooperation. The earliest inhabitants of the area now known as Burundi were the Twa, nomadic Hunter-gatherers who were largely replaced and absorbed by Bantu tribes during the Bantu migrations. By 1000 C.E., Hutu farmers had established themselves in the highlands, organized into chiefdoms. During the fourteenth and fifteenth centuries, Tutsi pastoralists with their cattle moved into the valleys. They relied on their cattle for milk, hides, and meat. Though numerically a smaller group, the Tutsis may have been able to gain ascendance as Hutus needed to come to them for employment when their crops failed. Around 1650, a kingdom was established under the Tutsis, with the Hutus largely in a feudal serflike relationship with the Tutsis. Until the downfall of the monarchy in 1966, kingship remained one of last links that bound Burundi with its pre-colonial past. Burundi was claimed by Germany in 1894, and in 1903, it became a German colony, along with Rwanda, when the king signed a treaty that would keep him in power. During World War I, control passed to Belgium. It became part of the Belgian League of Nations mandate of Ruanda-Urundi in 1923 and later a United Nations Trust Territory under Belgian administrative authority following World War II. Since Burundi's independence in 1962, there have been three events labelled as genocide in the country. 1965: The demographics of Burundi through the 1960s and 1970s was roughly 80 percent Hutu, dominated by a small Tutsi minority. Burundi gained its independence in 1962, and in May 1965, the first post-independence elections were held. The Hutu candidates scored a landslide victory, capturing 23 seats out of a total 33. Instead of a Hutu prime minister being appointed, the king appointed a Tutsi to the position. In October of that year, the Hutus attempted a coup. The king fled the country, never to return, but the coup ultimately failed. The Tutsi-controlled army arrested and executed many leading Hutu civilian and military personalities, and continued to rule the country for the next 21 years. 1972: On April 29, 1972 an insurrection, led by some Hutu members of the gendarmerie, broke out in the lakeside towns of Rumonge and Nyanza-Lac. Countless atrocities were reported by eyewitnesses, and the armed Hutu insurgents proceeded to kill every Tutsi and Hutu moderate in sight. It is estimated that during this initial Hutu outbreak, anywhere from "2,000 to 3,000" people were killed. President Michel Micombero proclaimed martial law and systematically proceeded to slaughter Hutus en masse. The initial phases of the genocide were systematically orchestrated, with lists of targets including the Hutu educated, the elite, and the militarily trained. The Tutsi-controlled army then moved onto the larger civilian populations. The Tutsi-controlled government authorities originally estimated that roughly 15,000 had been killed while Hutu opponents claimed that the number was actually far closer to 300,000. Today, conservative estimates hover between these two figures, at 100,000 to 150,000 killed in a period of just over three months. 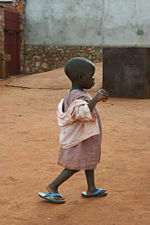 Over five hundred thousand are estimated to have fled the genocide into Zaire, Rwanda, and Tanzania. 1993: In 1993, Burundi held its first democratic elections, which were won by the Hutu-dominated Front for Democracy in Burundi (FRODEBU). FRODEBU leader Melchior Ndadaye became Burundi's first Hutu president, but a few months later he was assassinated by a group of Tutsi army officers. The Hutu community responded violently to Ndadaye's assassination and it is estimated that possibly as many as twenty-five thousand Tutsi were killed. The Tutsi-dominated army responded by killing at least as many Hutu civilians. Burundi was plunged into a vicious civil war. Today, the 1993 mass-killing of Tutsi is the only genocide officially acknowledged by the government. There is no official recognition of the Hutu victims of 1993, nor is there any recognition for the genocide of 1972. In effect, the genocide has been wiped from the official record, and forgotten by the international community in light of larger-scale genocides such as that of Rwanda. Results: The genocide of 1972 left a permanent mark in the collective memory of the Hutu population, both in Burundi and in neighboring countries. Tens of thousands of Hutu civilians fled the country during the violence into their northern neighbor, Rwanda. The increased tensions in Burundi and Rwanda sparked episodes of civil and cross-border violence in Burundi which inevitably resulted in more large-scale killings by the Burundian army. These episodes further radicalized elements of the Hutu population in Rwanda who also faced pressure from a militant Tutsi opposition known as the Rwandan Patriotic Front. In 1994, a Hutu-led genocide was perpetrated in Rwanda which, along with the resulting civil war, claimed the lives of between seven hundred thousand and 1 million people. Instability followed until 1996, when former president Pierre Buyoya took power in a coup d'etat. In August 2000, a peace deal agreed by all but two of Burundi's political groups laid out a timetable for the restoration of democracy. After several more years of violence, a cease-fire was signed in 2003 between Buyoya's government and the largest Hutu rebel group, CNDD-FDD. Later that year, FRODEBU leader Domitien Ndayizeye replaced Buyoya as president. Yet the most extreme Hutu group, Palipehutu-FNL (commonly known as "FNL"), continued to refuse negotiations. In August 2004, the group massacred 152 Congolese Tutsi refugees at the Gatumba refugee camp in western Burundi. In response to the attack, the Burundian government issued arrest warrants for the FNL leaders and declared the group a terrorist organization. In May 2005 a cease-fire was finally agreed on between the FNL and the Burundian government, but fighting continued. Renewed negotiations are now under way, amid fears that the FNL will demand a blanket amnesty in exchange for laying down their arms. A series of elections held in mid-2005 were won by the former Hutu rebel group CNDD-FDD. On September 7, 2006, a second cease-fire agreement was signed. The politics of Burundi take place in a framework where the president is both head of state and head of government and there is a multi-party system. Executive power is exercised by the government. Legislative power is vested in both the government and the two chambers of parliament, the Senate and the National Assembly. The president has officially called a cease-fire between the two warring parties in the civil war. Burundi is divided into 17 provinces, 117 communes, and 2,638 colonies. The capital city, Bujumbura, has by far the largest population. Smaller cities include Gitega, Muyinga, Ngozi, and Ruyigi. Burundi is a landlocked country with an equatorial climate. 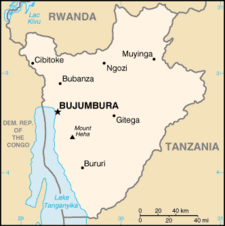 Called "The heart of Africa," Burundi lies on a rolling plateau, with Lake Tanganyika in its southwest corner. The average elevation of the central plateau is 5,600 feet, with lower elevations at the borders. The highest peak, Mount Karonje, at 8,809 feet (2,685 m), lies to the southeast of the capital, Bujumbura. The southeastern and southern borders are at roughly 4,500 feet (1,370 m). A strip of land along the Ruzizi River, north of Lake Tanganyika, is the only area below 3,000 feet (915 m); this area forms part of the Albertine Rift, the western extension of the Great Rift Valley. 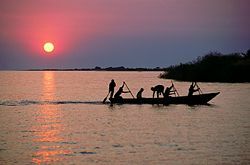 Because of its elevation, the nation's climate is temperate despite its proximity to the Equator, with the warmest and most humid area in the lowlands around Lake Tanganyika. There are two national parks, Kibira National Park to the northwest (a small region of montane rainforest, adjacent to Nyungwe Forest National Park in Rwanda) and Rurubu National Park to the northeast (along the Rurubu River, also known as Ruvubu or Ruvuvu). 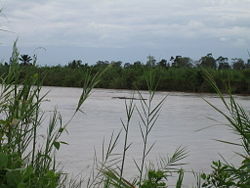 The farthest headstream of the Nile River is in Burundi. Although Lake Victoria is commonly considered the source of the Nile, the Kagera River flows for 429 miles (690 km) before reaching Lake Victoria. The source of the Ruvyironza River, an upper branch of the Kagera River, is at Mount Kikizi in Burundi. Burundi's largest industry is agriculture, which accounted for 58 percent of GDP in 1997. Coffee is the nation's biggest revenue earner, accounting for 90 percent of all exported goods. Other agriculture products include cotton, tea, maize, sorghum, sweet potatoes, bananas (of which Burundi is one of the world's ten largest producers), manioc (tapioca); beef, milk, and hides. Besides agriculture, other industries include light consumer goods such as blankets, shoes, and soap; assembly of imported components; public works construction; and food processing. As of July 2006, Burundi was projected to have an estimated population of 8,090,068, approximately half of whom are aged 14 or less. This estimate explicitly takes into account the effects of AIDS, which has a significant effect on the demographics of the country. Less than half the children attend primary school, and a higher percentage of those who go to school are Tutsi. Few Hutu go on to secondary school. Both sides in the civil war used child soldiers, and UNICEF estimated in 2004 that 6,000 to 7,000 children were still mobilized. Roughly 85 percent of the population is of Hutu ethnic origin; most of the remaining population are Tutsi, with a minority of Twa (Pygmy), and a few thousand Europeans and South Asians. The population density of around 753/sq. mi (315 persons/sq. km) is the second highest in sub-Saharan Africa, behind only Rwanda. The official languages are Kirundi and French, although Swahili is spoken along the eastern border. All Burundians enjoy music and dance. The Hutu use song for special occasions such as the birth of a child and harvesting crops, as well as for everyday events. The Tutsi also sing, with specific songs for activities in their lives such as feeding cattle. Dance, accompanied by drums, also serves ceremonial purposes. "The Master Drummers of Burundi" are the most famous performing group from the nation. Basket-weaving and pottery are crafts traditionally done by women for household use. Soccer is the most popular sport. ↑ Central Intelligence Agency, Burundi The World Factbook. Retrieved January 9, 2012. ↑ 3rd general census (2008) Retrieved January 9, 2012. ↑ 3.0 3.1 3.2 3.3 Burundi. International Monetary Fund. Retrieved January 9, 2012. ↑ Central Intelligence Agency, of family income – Gini index The World Factbook. Retrieved January 9, 2012. January 16, 2007, BURUNDI: Court acquits ex-president over coup plot, observed February 14, 2007. 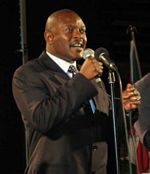 Burundi Events of 2006, Human Rights Watch, observed February 14, 2007. This page was last modified on 21 December 2016, at 22:51.